Two ever visits from this place, and the same flavour ordered up on both occasions. I have never been to an ice cream parlour before I stepped into the whimsical entry of The Big Chill. Nothing like I would have thought that would come out of in the pages of Archie’s Comics, An unevenly lit space, mis-matched props, and an extensive menu for the sweet tooth. The many, out of the usual Waffle cone, is their Ice Cream Sandwiches, Roll Cakes, Cake Pops, Banana Splits, and of course, they got you, my lactose-intolerant (dietary or not) folks, Non-dairy and Sherbert Ice Cream! 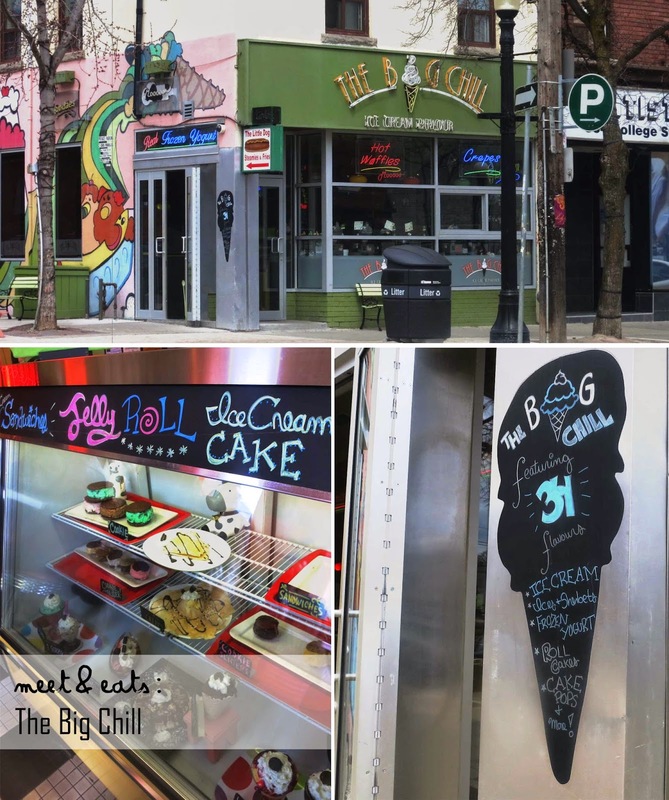 The Big Chill is a dandy go-to after a meal in the area, open until 11PM, this is easily an after-dinner spot. Grab a cone (cash only), and if the weather persists, take a walk around the area. College Street is such a nice area to walk along. They crispiest Waffle Cone that I’ve come across, these have definitely been freshly made. They also provide you with the delightful (free) option of a dollop of Whipped Cream on top, and of course, a tasty mini Oreo for a friend. I couldn’t go else where. They do this so dang good. A no brainer for a visit, you are bound to find one out of the 31 Flavours that you’d swoon over.